Cumbria’s Police and Crime Commissioner Peter McCall supports a project to help safeguard youngsters who are at risk of being sexually exploited. The impactful Child Sexual Exploitation (CSE) programme delivered by Brathay Trust and funded by the Police & Crime Commissioner (PCC) and Francis C Scott Charitable Trust (FCSCT) is to receive a third year of funding. Since October 2015 youth charity Brathay Trust, based in Ambleside, has delivered a ‘Be SAVY’ (Be Safe & Value Yourself) programme working with the police in Barrow and Whitehaven. Cumbria’s PCC also financed one other intervention strand; a peer leadership programme for 18-25-year-olds. Peter McCall said: “I am pleased that we are able to provide the funding for a third year for this excellent project to help keep our youngsters safe. I have made a commitment to support young people in our communities, and I know that working together with our partners and agencies, like the Brathay Trust, that we really can make a difference to the lives and prospects of young Cumbrians. Jacqueline Wallace, Brathay’s Cumbria Projects Manager, said the charity was very grateful for the funding and for news that the programme will be extended for a further year. She said: “So far 21 girls, between 11 and 17-years-old, have completed community based six month ‘Be SAVY’ courses with a residential at Brathay Hall. As a result of that 82% said they were more able to recognise a healthy relationship and 88% felt they had a greater ability to sort out problems they might face. And now, with another year’s funding, Brathay will be able to deliver ‘Be SAVY’ sessions to 20 youngsters with the first targeted intervention programme starting shortly in Millom. In addition, and on the back of the success of their CSE programme in Cumbria, Brathay have secured three year’s funding to expand it into North Lancashire. Attached image shows: thanks to further funding and police support young people in Cumbria, at risk of being sexually exploited, are getting help. 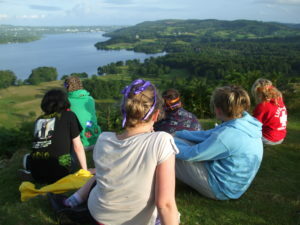 Part of the intervention programme, delivered by youth charity Brathay Trust, involves a Lake District residential.